Sorry I haven't been writing.. it's just that every time I think I will write something, a new development occurs. It's day four after the huge earthquake, and things are not back to normal. Things that are strange? Every single TV channel has been showing nothing but news. News about new quakes, new aftershocks, new areas that are being affected. The day after the quake, just here in Tokyo we felt at least a dozen minor tremors. We couldn't peel our eyes from the TV which was just catching up to the effects of the tsunami around Sendai. It's crazy, entire cities were washed away. You can really see how absolutely surreal the situation is by looking at this link that shows the before/after view. 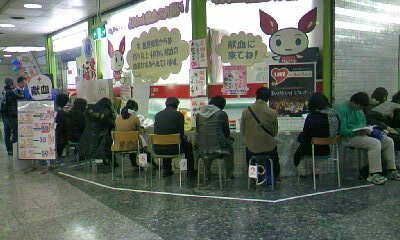 On Sunday, we were all feeling determined to do something for the tsunami victims, so I went and donated blood at Shinjuku's west exit Red Cross Japan donation station. There was an encouragingly long line, and even though there was a complicated list of requirements and countries you couldn't be from to donate, the US wasn't one of them, and before long I was getting 200 ml of blood out and soon enough was the proud owner of a Hello Kitty x Kenketsu-chan mascot gift(blood donation has a mascot here. yes, welcome to Japan). 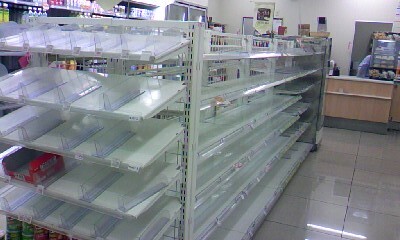 2. people panicking and buying everything to stock up in case of another disaster. 3. people panicking and buying all the gas to try to get out of town, limiting gas for delivery trucks. as you can see, there is a lot of panic going on. This was not helped by events at the Fukushima power plant one bit. Takeshi was talking seriously about getting out of the country, convinced a nuclear cloud would hover over the city and rain death on everyone. I did some checks with various news sources and talked with friends (I found out one of my friends from futsal all this time works on nuclear systems for his job!) and they were all very convincing that, considering the plant withstood an earthquake 5 times stronger than it was rated for PLUS a tsunami, it is doing a great job. The biggest problem it might have had was if plant was still online, but as soon as the quake hit it went offline automatically. As long as it's offline, the rods might melt and cause a mess and some radioactive isotopes to get into the air, but these airborne particles have a short halflife and will lose their radioactivity as they get farther from the plant (12 miles or so). Even *within* the 12 miles the radiation is not as bad as newspapers seem to be hinting - like maybe getting an xray. So *I* know it's safe. The experts know its safe. The Japanese government, the US government, the UK embassy know it's safe. (Except for France which is evacuating its tizens as we speak). But it's goddamn hard to stay calm when everyone around is wearing masks to protect from radioactive pollen getting in their lungs, even if the risk is negligable. Since the nuclear plants were providing a generous serving of energy to most of north and western japan, we suddenly have a loss of power. Blackouts are scheduled, and to accomodate them, trains are running less frequently. We turn on the news, and we see reports of thousands(!) of bodies washing ashore about 200 miles north of here. I went to the office on monday, and half of the lights are off to save electricity, a weird hushed silence as we all check online for the news and talk about our twilight-zone weekends. We were dismissed early on Tuesday, told to go home and stock up in case we can't leave the house because of power plant troubles. Like I said, the scientific facts all point to this not being a problem, but the general paranoia is a real problem. My Korean friends were called by screaming mothers ordering them to get their asses home. The French embassy is requesting for its citizens to leave for southern japan, and getting some air france planes to get them home. And meanwhile, even four days after the big one, the tremors don't stop !! There is at least one magnitude 6.0 or higher quake somewhere around here once every six hours! Last night there was a 6.2 one measured with it's epicenter close to Mt. Fuji. Considering that volcano is about 300 years overdue for an eruption, I can't help but eye it suspiciously.... I mean, it probably won't. But with everything that's happening, you can't quite cross it off the list. Maybe I'll be able to give those elementary school kids a first hand account after all! Thanks for keeping us updated. As usual your writing skills are really superb! The panic is a real concern. I've been trying to keep thing light and upbeat, but already two of my co-workers have left the country!! Amazing. I was looking for rice today and still couldn't find any. We had to bum some off of our in-laws. Good on ya for donating blood. That is a great idea. I'll try to do that soon also. A different friend sent me the Paul Atkinson note! Hmm, how about a nice extended vacation to the states? Not that we're safe from shaking either but at least we're not out of ramen yet. Glad to hear you and Takeshi are ok and thanks for the updates! It's funny, I was at Home Depot and saw a sales rack for emergency backpack kits that was almost empty. I think everyone is seeing Japan in the news and thinking...uh-oh, better stock up on supplies and bolt everything down.